The release date of the upcoming 0.9.3 version is drawing nearer. Several format classes have already been exposed to Python and in this post I’m going to show you some code snippets. Since it’s impossible to demonstrate all format classes (12 have already been exposed) and all their methods (a single class may contain dozens of methods), the purpose of the snippets below is only to give the reader an idea of what can be achieved. The SDK organization has changed a bit: because of its increasing size it made sense to subdivide it into modules. Thus, there’s now the Pro.Core module, the Pro.UI one and one module for each format (e.g. Pro.PE). 0040 94 0A 35 67 BB EC 66 D0 CE 1B D1 83 34 75 48 92 ..5g..f.....4uH. 0050 04 46 C7 B0 0E 53 E0 EC 48 E3 09 3C 1B 4A FB 86 .F...S..H..<.J..
0060 18 43 AF 14 68 19 7D 88 1C 05 52 05 3F 50 D7 DF .C..h.}...R.?P..
0070 C7 73 3B FD FD A7 2B 67 85 B8 CA 58 89 6A 5E 02 .s;...+g...X.j^. 0 1 2 3 4 5 6 7 8 9 A B C D E F Ascii 0000 31 20 67 0D 0A 30 2E 35 20 47 0D 0A 31 20 4A 20 1 g..0.5 G..1 J 0010 30 20 6A 20 31 20 77 20 34 20 4D 20 5B 33 20 5D 0 j 1 w 4 M [3 ] 0020 30 20 64 0D 0A 2F 47 53 32 20 67 73 0D 0A 31 20 0 d../GS2 gs..1 0030 69 20 0D 0A 31 39 38 20 36 36 36 20 32 31 34 20 i ..198 666 214 0040 35 38 20 72 65 0D 0A 42 0D 0A 42 54 0D 0A 2F 46 58 re..B..BT../F 0050 32 20 31 20 54 66 0D 0A 31 32 20 30 20 30 20 31 2 1 Tf..12 0 0 1 0060 32 20 32 31 37 2E 38 38 20 36 39 30 20 54 6D 0D 2 217.88 690 Tm. 0070 0A 30 20 30 20 30 20 31 20 6B 0D 0A 30 20 54 63 .0 0 0 1 k..0 Tc 0080 0D 0A 30 20 54 77 0D 0A 5B 28 50 29 34 30 28 61 ..0 Tw..[(P)40(a 0090 73 74 65 20 74 68 65 20 66 69 65 6C 64 20 61 6E ste the field an 00A0 64 20 6D 6F 29 31 35 28 76 29 32 35 28 65 29 30 d mo)15(v)25(e)0 00B0 28 20 74 6F 20 68 65 72 65 29 31 35 28 2E 29 5D ( to here)15(.)] 00C0 54 4A 0D 0A 45 54 0D 0A TJ..ET.. 0060 32 20 32 31 37 2E 38 38 20 36 39 30 20 54 6D 0D 2 217.88 690 Tm. 00C0 54 4A 0D 0A 45 54 0D 0A TJ..ET.. 0050 6F 63 75 6D 65 6E 74 2E 38 00 F4 39 B2 71 00 00 ocument.8..9.q.. The same can be done for ActionScript3 using the ABCFileObject class. In the upcoming post(s) I’m going to put it all together and do some very interesting things. So stay tuned as the best has yet to come! The main feature of the upcoming 0.9.3 version of the Profiler is the expansion of the public SDK. This basically means that a consistent subset of the internal classes will be exposed. Although it’s a subset, there’s no way to document all methods and functions. Fortunately, many of them should be quite intuitive. NTContainer: this is a generic container which is used to encapsulate data such as files and memory. It’s an extremely important class, since it’s used extensively. Containers can for the time being be created through SDK functions such as: createContainerFromFile/newContainer. NTBuffer/NTContainerBuffer/CFFBuffer/etc. : used to efficiently read iteratively small amounts of data from a source. NTTextStream/NTTextBuffer/NTTextStringBuffer: used to output text. Indentation can be specified. NTXml: used to parse XML. Fast and secure. This class is based on RapidXML. CFFObject: the class from which every format class inherits (ZipObject, PEObject, etc). A very small subset of this class is exposed for now. This will change in the future. CFFStruct: representation of a file format structure. CFFFlags: representation of flags in a CFFStruct. fstr = "<flts><f name='misc/basic' operation='xor' bits='8' value='CC'/></flts>"
With just three of the modified lines we are xoring all opened files with the value 0xCC and then show the resulting data in the hex view. The Profiler provides a huge number of filters for any kind of operation and they can be chained, so we could easily compress and then encrypt a file with AES by just replacing one line in the sample above. The function applyFilters displays an optional default wait dialog to the user to interrupt the operation (if it is executing in the main thread). Please remember that the easiest way to obtain the needed filters XML string is to use the UI view and use the export command from the list (context menu->Export…). b.read(10) # or b.u8(), b.u16(), etc. Please notice that the code above misses several checks. We need to make sure that c is valid and Load succeds. I’ll omit these checks here to keep the code minimal. Nice, isn’t it? Remember we can change the indentation programmatically. Of course, it will also be possible to get the object currently being analyzed and similar stuff. But we’ll see how to do that in another post. If you’re wondering why the case convention for methods is not always the same, the reason is simple. CFFObject/CFFStruct/etc are based on older code which followed the Win32-like convention. Consequently all derived classes like PEObject follow this convention. All other classes use the camel-case convention. 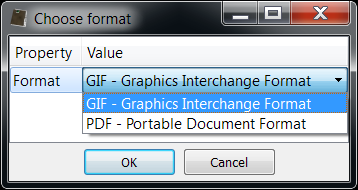 To better help with the identification of files which can be interpreted as different formats, the individual file dialog features now some additions. 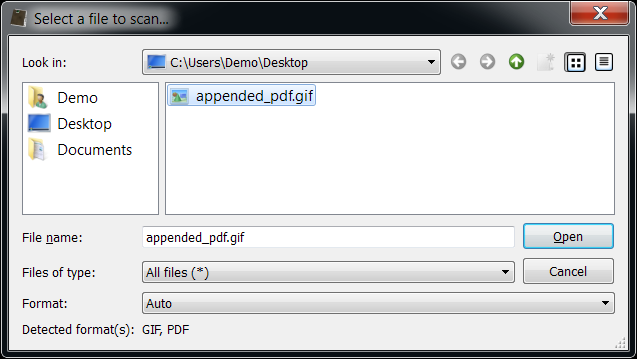 As you can see the identified formats for the currently selected file are listed (it’s a simple GIF file with a PDF appended at the end). The dialog gives the user also the ability to manually choose the format to use for loading the file. While all this could be achieved even before, it wasn’t as handy as it is now. However, it wouldn’t make sense to display the file selection dialog when the user uses the shell integration or drops a file to open it. So, instead the Profiler displays a choice dialog for the format in case multiple formats are detected. Some new filters are available: from/to hex/base64. While the actions in the Profiler already feautured a mechanism to do these conversions, having them as filters is extremely useful, because it allows to use them to load embedded files or to convert large portions of data. While it has always been possible to manually extract through filters data or partial data from damaged Zip files (e.g. those missing a Central Directory), now the embedded data is automatically analyzed and ready for inspection. This means that even when a Zip archive is truncated and some compressed files are truncated as well, they will nonetheless be automatically detected and be available for inspection by the user. As you can see many improvements have been introduced. The most important of them is of course the removal of the virtual memory constraints as it represents an important step in the roadmap of the Profiler. Stay tuned as the next version will be important as well!